San Lazzaro dei Mendicanti was founded by the Mendicant Friars, who back in 1224 ran Venice's first hospital for lepers, initially next to the church of San Trovaso, and later on the island of San Lazzaro. In 1500, after the building of the nearby Basilica of SS. Giovanni e Paolo, there was enough money left over to build a hospital, one that became one of the four main hospitals in Venice, run by the same Mendicant Friars, for lepers, beggars and orphans. In 1601, Vincento Scamozzi was commissioned to build its single nave church. The canal façade was added by Giuseppe Sardi in 1673. Like La Pietà, one of San Lazzaro's missions was to take in orphan girls and teach them music; Vivaldi's father taught here from 1689-93. One of the rare survivals in the church are the grilles used to separate the girls' choir from the congregation. It has several notable paintings, including a colourful St Ursula and the 11,000 Virgins at Cologne by Tintoretto; a Crucifixion by Veronese, and a St Helen by Guercino. 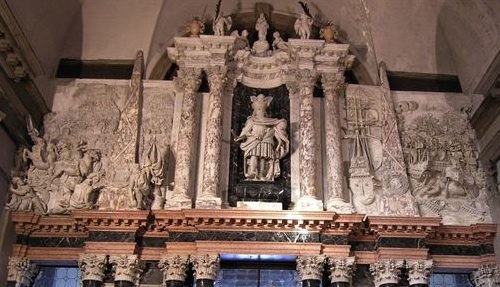 The back wall is entirely taken up with the funeral monument to Alvise Mocenigo completed by Sardi, honouring the Admiral who died in battle in 1654, defending Crete (then part of the Venetian empire) from the Ottomans; one of the high reliefs depicts the 22 year long siege of Heraklion (Candia). Several other funeral moments in the church are by Longhena. It now serves as the chapel of the Civic Hospital of Venice, which is why it's rarely open.